Amid increasing campaigns against Halal meat in the UK, the British government said it had “no intention” to ban the religious slaughtering of animals for Muslims and Jews. 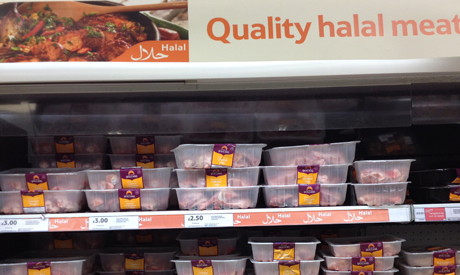 According to the Government’s Food Standards Agency, the large majority of halal does come from animals which have been stunned. Jewish and Muslim leaders accuse animal welfare lobbyists of campaigning against the non-stun religious slaughter of animals to the exclusion of almost all other welfare issues. An All Party Parliamentary Group (APPG) for beef and lamb has published a Report which calls for more research into the religious slaughter of animals. A parliamentary committee has called for further research into recoverable stunning methods that could be acceptable to some halal meat consumers’. MUSLIM and Jewish communities in Scotland have hit out at a campaign set up by vets which calls for all animals to be stunned before slaughter to avert suffering. However, an exemption in UK law allows animals to be slaughtered without stunning for certain religious communities. He called on Muslims and Jews to allow the livestock to be stunned unconscious before they are killed, or introduce labeling of non stun.